Prince Hassan Bin Talal - Jordan’s former Crown Prince and the uncle of Jordan’s current ruler - King Abdullah - has floated a possible new diplomatic initiative by reminding the world that the West Bank was once part of Jordan. The West Bank and Transjordan had existed as one territorial entity between 1950-1967 following Transjordan’s occupation of the West Bank in 1948 after the newly declared State of Israel had been attacked by six invading Arab armies. Transjordan - as a result - changed its name to “Jordan” and named the territory west of the Jordan River as the “West Bank”. Until then - the West Bank had been known for thousands of years as “Judea and Samaria” - the biblical and ancestral homeland of the Jewish people. These decisions were not taken in isolation by a victorious occupier against the wishes of a defeated and dispirited population - but at the request and urging of the exclusively Arab population living in Judea and Samaria. All the Jews who had been living there prior to the 1948 war had been dispossessed and forcefully driven from the area conquered by Transjordan. A conference was held in Jericho on 1 December 1948 - attended by several thousand people including the mayors of the towns of Hebron, Bethlehem, Ramallah, the Arab Legion Military Governor General and military governors from districts in Judea and Samaria, and other notables. Wells Stabler - America’s charge d’affaires in Transjordan - reported to the Acting Secretary for State in a confidential cable dated 4 December 1948 that following the meeting - a large delegation proceeded to the King’s winter quarters at Shuneh to present the resolution to the King and request his acceptance. The King had replied that the matter must be referred to his government and that he must also ascertain the views of other Arab states. Although usual jealousies and frictions had been apparent during the meeting, the King believed it to be of significance and might be regarded by him as his mandate from Palestine Arabs. 1. The King believed that annexation of Arab Palestine to Transjordan would be an “actual help” in reaching a final settlement. 5. 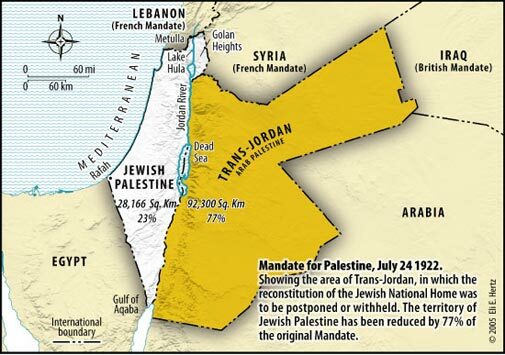 Bunche had hinted to His Majesty that the annexation of Arab Palestine by Transjordan would probably be accepted as fait accompli in view of Transjordan’s present position in Arab Palestine. Jordan lost the West Bank to Israel in the 1967 Six Day War and renounced any claims to the West Bank in 1988. After 19 years of fruitless negotiations between Israel and the Palestinian Liberation Organization since 1993 - the settlement of competing claims by Jews and Arabs to sovereignty in the West Bank still remains undetermined. Prince Hassan’s statement on 9 October clearly attempts to resuscitate Jordan’s territorial claim to the West Bank. The vacuum existing in 1948 has returned - and once again Jordan is the party that can fill it by opening negotiations with Israel to end the the Jewish-Arab conflict by reunifying the two banks of the Jordan River - taking into account the vastly changed circumstances to those existing 64 years ago. Seizing this rare opportunity should not be missed.